Andy Wood is the Lead Pastor of Echo.Church. Andy and his wife Stacie started South Bay Church in 2009 with two other families. South Bay Church officially changed their name to Echo.Church in January of 2018. Echo.Church has become one of the fastest growing churches in the most unchurched area of the United States and is now reaching over 2,300 people in regular attendance in three locations across Silicon Valley. 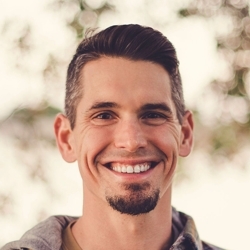 Andy's passion is to create environments that engage the unchurched people of the Bay Area. Along with leading the church, Andy enjoys investing time in helping church planters and church leaders think more innovatively and strategically to reach people in the most unreached areas of North America. To help with this he founded an organization called Frontline Coaching. Andy and Stacie have three kids, Caedmon, 11, Sammy, 10 and Karis who is 4. This makes them pray a lot!